Getting around the island of Sulawesi can be a challenge at the best of times, with many areas being somewhat remote and lacking in public transport. 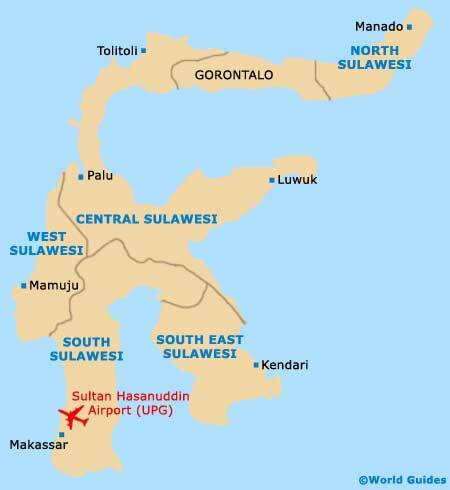 However, the main towns or cities on Sulawesi enjoy a very reasonable travel infrastructure, particularly around Makassar. The city of Makassar is especially hot and therefore travelling around by becak (bicycle rickshaw), mikrolet / opelet / pete-pete (intracity minibus) or shared taxi can often provide a welcome relief to the high temperatures. Rental cars are popular in some areas of Sulawesi, although many holiday makers do simply prefer to rely upon the sheer convenience of bus transport and taxis to travel between the main towns and cities on the island. On the northern side of the island and at Manado in particular, rental cars are is good supply, being readily available at the Sam Ratulangi International Airport. Some vehicles can even be hired complete with their own personal driver, who will be happy to transport you to accessible places of interest and attractions. The Trans-Sulawesi Highway connects Manado with Makassar and this road is both long and winding. In Central Sulawesi, the condition of the roads is quite variable, and so 4WD jeeps and motorcycles are the best self-drive options, suiting those intending to pay a visit to the Lindu National Park. The area around the south-west peninsula of Sulawesi, particularly at Makassar, offers a well-developed network of roads, which are regularly used by public transport, in the form of buses. Smaller and less comfortable minibuses also travel along these routes and are known locally in Sulawesi as either bemo, mikrolet or pete-pete. In Makassar, there are three main bus terminals, which are likely to be of use to holiday makers and travellers. These are the Panaikang Terminal on the easterly suburbs (close to the airport), the Mallengkeri Terminal (some 10 km / 6 miles to the south-east of the centre), and the nearby Sungguminasa Terminal. From these stations, buses travel to various destinations around Sulawesi, such as Bulukumba (three hours), Malino (one and a half hours), Panaikang (30 minutes), Pantai Bira (four hours), Pare Pare (three hours), Rantepao (eight hours) and Sengkang (four hours). Other regions of the island are not always so easy to get around using public transport, with roads being rough and long, and buses often being very crowded. Therefore, when travelling through Central Sulawesi, do be sure to allocate plenty of time for your journey, especially during the wet season. There are currently no trains operating on the island. At Sultan Hasanuddin Airport in Makassar, taxis are on hand to transport you to your hotel, being simple to arrange on a prepaid basis at the relevant booth, next to the arrivals area. Most will include an additional charge for driving along a toll road, which makes the journey much quicker. Other prominent airports, cities and towns on Sulawesi also use taxis extensively for short journeys, with fares either being fixed for set journeys, or calculated by meters. On the south-eastern and south-western peninsulas of Sulawesi, 4WD 'Kijang' taxis are popular and perfect for negotiating the changeable roads and terrain. The island of Sulawesi is well connected by passenger boats and ferries, with the most prominent ports being located on Bitung (north coast, close to Manado) and Makassar (south coast), as well as Luwuk in central Sulawesi, Pare Pare (Parepare) on the south-western coast, and Gorontalo and Tolitoli (Toli Toli) on the north coast. From Sulawesi, boats travel between Bali, the Maluku Islands, Jakarta (West Java), East Kalimantan, Northern Papua and Nusa Tenggara, amongst other destinations.